To me, my daughter is the cutest, most adorable little person around, and I love keeping her warm and dry in the cutest, most adorable way possible. I've been a huge fan of Kidorable, every since I had the chance to review the Lotus Flower Hat, Scarf and Mittens Set almost a year ago. Kidorable has such a wide variety of children's outerwear in a whole slew of fun styles, that it is easy to create quite a wish list for your kiddo while shopping their online store. 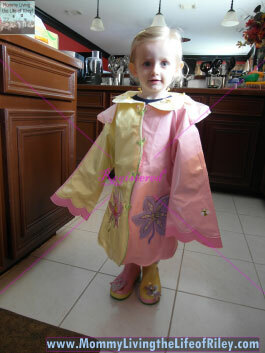 Recently, I had the chance to review the Lotus Flower Rain Coat and Rain Boots for Riley. Keep reading to learn all about them! I reviewed the Lotus Flower Rain Coat and Lotus Flower Rain Boots from Kidorable, which retail for $36.00 and $29.00, respectively. 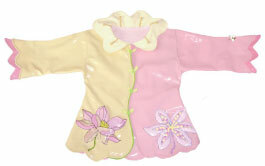 The Lotus Flower Rain Coat is by far the most precious children's rain coat I've ever seen. This rain coat is constructed of high-quality PVC for superior protection from the elements, and lined with polyester, for a comfortable fit. There are so many wonderful details to this rain coat, such as petal detailing around the sleeves, neckline and hemline, and even two lotus flowers on the front, which are really pockets. I loved the detachable hood which easily snaps onto the rain coat's neck and the snaps up the front, which resemble tiny leaves and a stem. There are even two small bees buzzing around on the beautiful soft pink and yellow background of this rain coat. 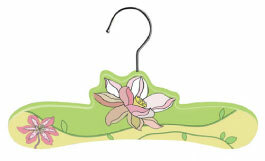 As if that weren't enough, the Lotus Flower Rain Coat even comes complete with its own hand-painted wooden hanger to store it on. 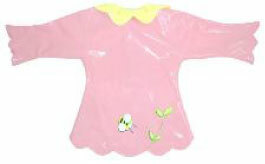 This is one delicate and lady-like rain coat which will have your daughter looking like a small flower princess and staying dry at the same time. 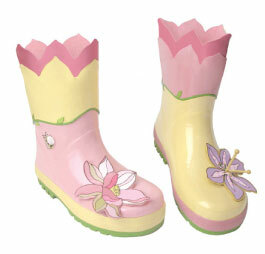 The matching Lotus Flower Rain Boots are just as detailed and stylish as its rain coat counterpart. Each boot has a 3-dimensional lotus flower on the toe and flower detailing around the top of the boot. There is even a wandering bee on the rain boots too and I love how well the boots compliment the rain coat. They are constructed of natural rubber and guaranteed to keep your child's little piggies completely dry. Since Riley is growing like an absolute weed these days and I really wanted her to have a nice rain coat and boots set for when she goes to school, I ordered her a size 5, which is perfect for preschool or kindergarten. Just because the Lotus Flower Rain Coat and Rain Boots are too big right now, that hasn't discouraged Riley. She LOVES wearing her Kidorable rain gear around just as you see above. The boots are by far her favorite and most days she can be seen tromping around the house or backyard in them, no matter the weather! I highly recommend Kidorable children's outerwear for your own children or as the perfect gift for another special child. 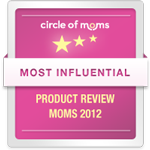 All of their products are of the highest quality and are the cutest, most fun styles around. "Neither snow, nor rain, nor heat, nor gloom of night stays" your child from being warm, dry and adorable with Kidorable! 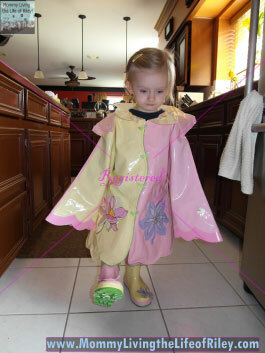 Disclosure: I received the Lotus Flower Rain Coat and Lotus Flower Rain Boots from Kidorable in order to facilitate my review. No other compensation was received. This product review is based on my own personal experiences with this item and is completely honest and objective. I’d love to win the Frog and I am following you via Google Friend Connect (susanlanai). I Follow Kidorable on Twitter. I follow Toothpaste 2 Go on Twitter @susanlanai. 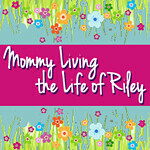 I “Like” Mommy Living the Life of Riley! (susan chew). I follow via Networked Blogs (susan chew). 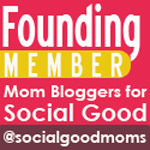 I follow you on Google Buzz (susanlanai) 1. 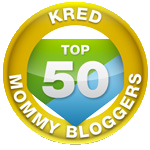 I follow you on Google Buzz (susanlanai) 2. I subscribe via email (susaaan@gmail.com) 1. I entered your Sticky Jewelry giveaway. I entered your La Posh Style giveaway. I entered your Rumba Time giveaway. I entered your Lauren Nicole giveaway. I entered your GelPro giveaway. I entered your Neat-Oh! ZipBin giveaway. I entered your Pearlotica giveaway. 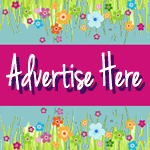 I entered your Kelly Moore Designer giveaway. I entered your June Cleaver Nirvana’s Daily Laughs giveaway. 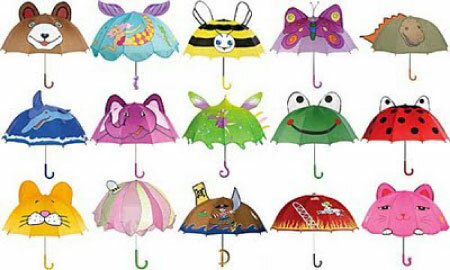 I like the butterfly umbrella. But whatever is given is fine with me.